The "Montoya" Grill Island Project by Leisure Select is really a "complete-my-backyard" project, with a Grill Island on the patio and a gorgeous Pergola over the deck. Let this project serve as inspiration for your outdoor space; with this project as the basis, you will create an Outdoor Room that functions perfectly for your family every day, yet will impress guests on special occasions. 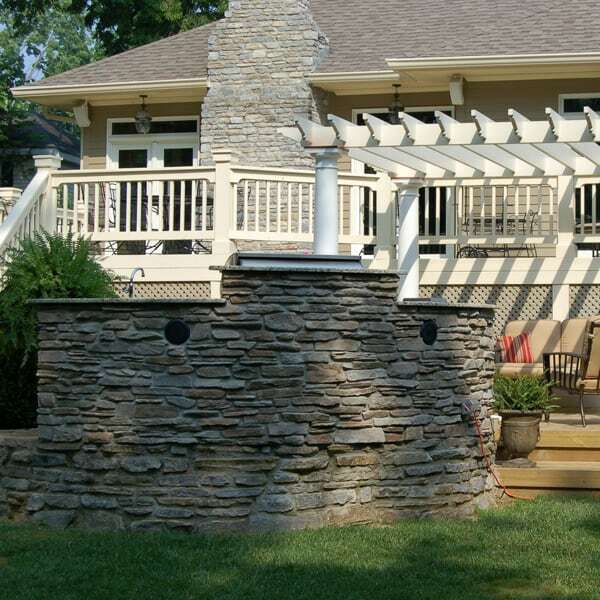 Notice how the stone in this grill island wraps around the patio, adding a stunning rock wall in the backyard, hiding the grill from view. The grill island stone, just like the wood in the pergola and the granite, stucco, accessories in the grill island and virtually everything else in this project, is completely customized, chosen by the homeowner to match their home. And the available accessories are nearly endless; this grill island and pergola project offers everything you would need in an outdoor kitchen, such as a refrigerator, sink, side burner, gas grill and even a stereo with speakers facing the backyard! So let your imagination run wild with the "Montoya" Grill Island Project from Leisure Select! Contact Family Leisure today and ask about this grill island and pergola project! 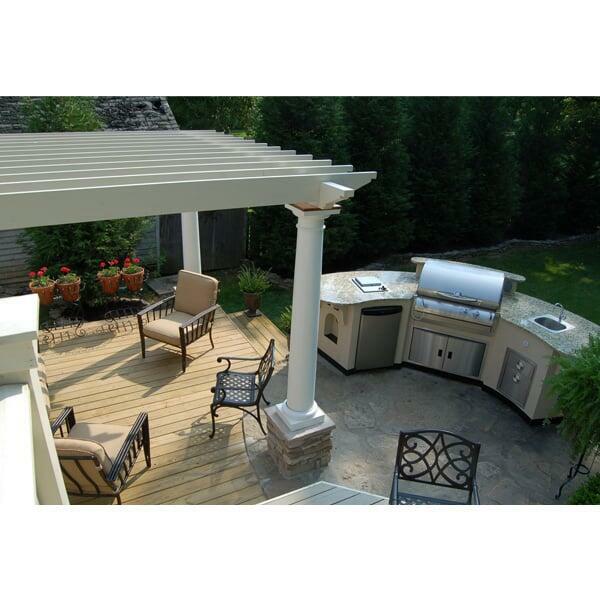 Our full line of grill islands, pergolas and outdoor kitchens are made from the highest quality materials and are custom made to your specifications. The cultured stone, wood, stucco and tile are available in a variety of shapes and colors to match your outdoor decor and in most cases (such as in the "Montoya" project) granite can be used in place of tile. 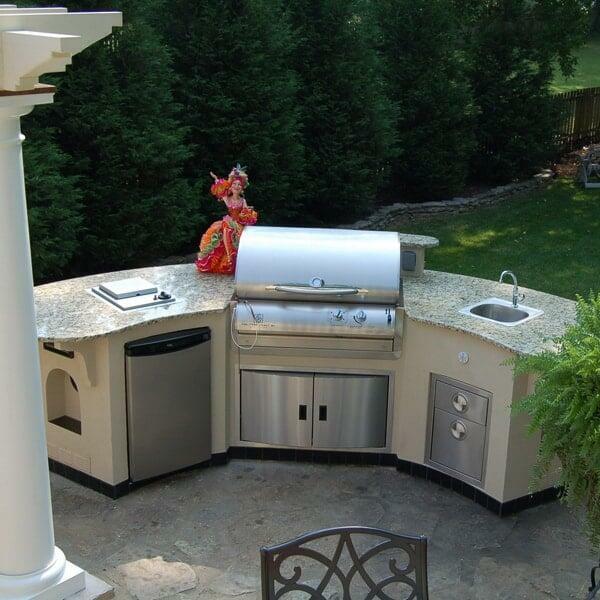 You have numerous options when choosing the grill and accessories that you would like to have for your island. We exclusively use Bull BBQ Grill Products to ensure that you are getting the best cooking results and peace of mind in knowing that all the stainless steel components carry a lifetime guarantee. Add lighting and an outdoor stereo to create the perfect ambiance and you are ready for the ultimate in outdoor entertaining.